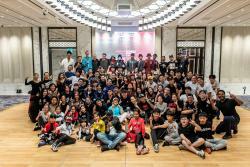 The highly acclaimed hip-hop dance crew Jabbawockeez, who is now having their first residency show in Macau, recently conducted a workshop for local dance enthusiasts. The highly acclaimed hip-hop dance crew Jabbawockeez, who is now having their first residency show in Macau, recently conducted a workshop for local dance enthusiasts. The workshop stood as a platform for the community to connect with the internationally-known dancers, broadening their horizons and offering them an opportunity to learn from the best of the best. The JABBAWOCKEEZ: true to yourself at MGM COTAI has been a big hit in Macau! This special dance workshop, taught by Jabbawockeez original members Kevin “KB” Brewer and Rynan Paguio, attracted over 80 enthusiasts from the city’s various dance associations, aged 6 years old and above. The participants were thrilled to have the rare opportunity to freestyle and hit the floor with the famed dance crew as they broke down the moves into a step-by-step. After the workshop, the crew also shared their inspirational stories and tips with the young dancers, as a way to motivate and encourage youth to pursue their dream. “I am pleasantly surprised as the ability of the local dance community is beyond my expectation. I tried to do something that is of a medium level, not too easy and not too difficult to see what the people are at and they all got it.” said Kevin “KB” Brewer.